This is a traditional Japanese dish and it’s called “Kōhaku Namasu”. “Kōhaku” means “red and white”, this combination of colour is a symbol for auspicious or happy occasions in Japan, and Kōhaku Namasu is one of the festive food for the New Year. 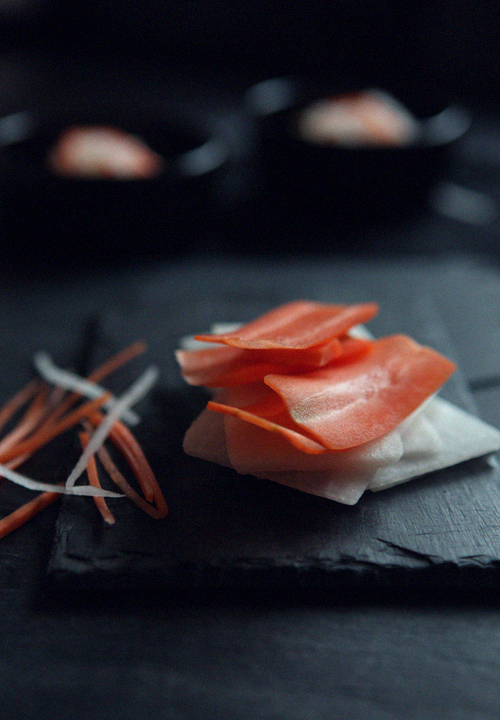 White daikon radish and red (actually it’s orange…) carrot are lightly pickled in sweetened vinegar. It’s a light and refreshing side dish. Peel the radish and carrot and cut into about 2 inch long thin strips. Place in a bowl, sprinkle with the salt, mix and leave for about 15 minutes. Squeeze well to remove excess water. Combine the rice vinegar and sugar in a small bowl. Pour the vinegar mixture over the radish and carrot and mix well. Cover and place in the fridge for few hours. 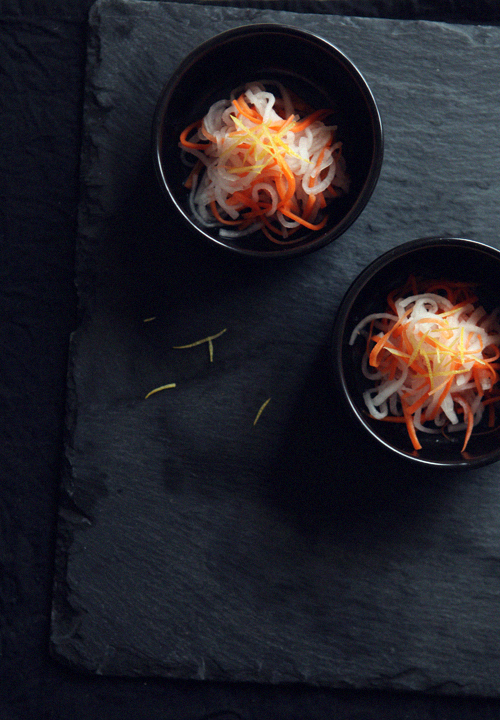 Just before serving, garnish each portion with julienned yuzu or loon peel. You are currently reading Pickled Radish and Carrot Salad at Fish Trip Cafe.